Since 1981 Shannons has been Australia’s leading auction house for veteran, vintage, classic, sports and modified vehicles, as well as classic motorcycles, automotive memorabilia and number plate sales. 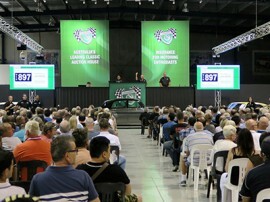 Shannons Auctions have re-shaped the classic vehicle market, setting the reference point for Australian values and becoming the first choice for both private individuals and Government departments, including numerical and special number plate sales. Shannons takes the hassle and frustration out of the selling process, and offers enthusiasts the convenience of purpose built showrooms in both Sydney and Melbourne. Shannons new Online Bidding allows people to watch a live stream of the auction and place bids online, in real time on all auction lots. Absentee and telephone bidding will continue to be available, however the online bidding feature allows enthusiasts to bid from anywhere in Australia or overseas. Contact our Auction Team in Sydney Iain Kelly and Stuart Roberts or in Melbourne Ryan Lednar and Rodney Hansen.